With their creamy white blossoms, glossy green leaves and lush fragrance, gardenias are a Southern garden staple. 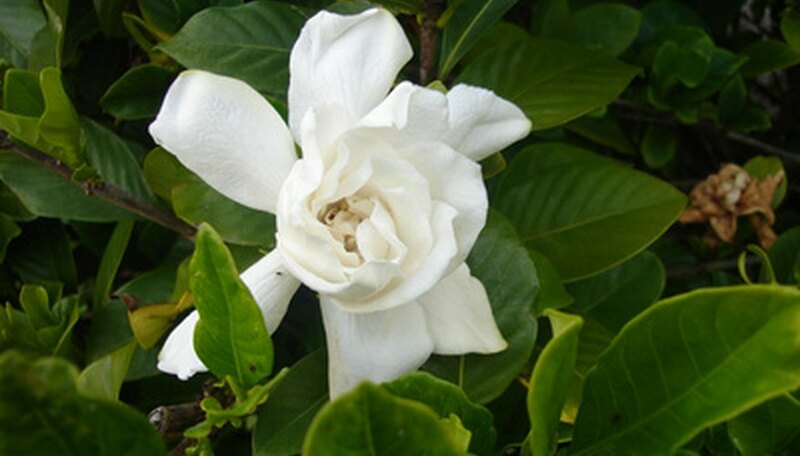 Georgia gardeners can plant many types of gardenia, including August Beauty, Cape Jasmine Variegata and Cape Jasmine Klein's Hardy. Gardenia reach 2 to 8 feet in height and width, so choose a spot that offers enough room for the plant to mature. Select a site for your gardenia. This plant prefers partial shade, and works well when planted beside a porch. Test your soil pH. According to Clemson University, the typical Georgia soil has a pH between 5.0 and 5.5. This pH works well for gardenia, which need a mildly acidic pH of 5.0 to 6.0. If your soil is too alkaline, amend it by adding 1.2 oz. of sulfur per square yard. This lowers the pH by 1. Prepare the hole for your gardenia sapling. Dig a large hole, twice the width of your plant's root ball and as deep as the root ball. Jab the shovel at the bottom of the hole to loosen up the soil, which helps the roots take hold. Remove your gardenia from its plastic container. Break apart the plant root ball and separate any tangled roots. Place the gardenia in the hole. Fill the hole halfway with soil, then add water to settle the soil. When the soil compresses around the roots, fill the rest of the hole with soil. Add water until the soil becomes saturated. Give the gardenia 1 inch of water per week. If it rains, skip or reduce the watering. Layer 2 inches of mulch or pine straw around the base of the gardenia tree. This helps the soil retain moisture. Fertilize the gardenia with an acid fertilizer monthly from April to November. Scatter the fertilizer around the base of the gardenia before watering, then water to disperse the fertilizer.